The Keith Jarrett Trio, playing live at NDR Funkhaus, Hamburg in July 1972. The trio with Haden and Motian was Jarrett’s first great band, his choice of players a masterstroke. Charlie and Paul hadn’t worked together until Jarrett brought them into each other’s orbit in 1966. With the bassist who had learned his craft in Ornette Coleman’s band, and the drummer from Bill Evans’s ground-breaking trio, Jarrett was able to explore the broadest scope of modern jazz, from poetic balladry to hard-swinging time-playing to ferocious and fiery free music. 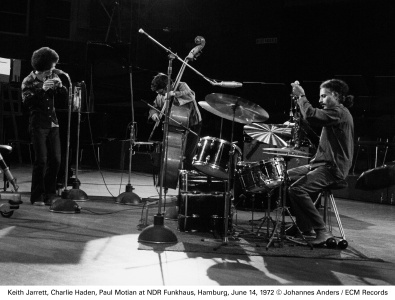 The improvisation heard in the Hamburg concert includes episodes with Keith on soprano sax and flute as well as piano, while Motian expands the role of percussion in the music, developing the supple, elastic, supremely unpredictable vocabulary that would subsequently become such a crucial part of both Jarrett’s groups and Paul’s own. The interaction between the three musicians is uncanny throughout, reaching a peak in an emotion-drenched performance of Charlie Haden’s “Song for Che” (this is Jarrett’s only recording of a piece that has become a new jazz classic). But from the first notes of “Rainbow”, with its radiant piano, it is clear that something special is happening here. The Hamburg concert dates from the beginning of ECM’s association with Keith Jarrett, whose solo album Facing You had been recorded the previous November and released just three months before this show. In the US, Keith Jarrett had begun to include saxophonist Dewey Redman in his group music and the trio was in the process of morphing into the group colloquially known as Jarrett’s American Quartet. 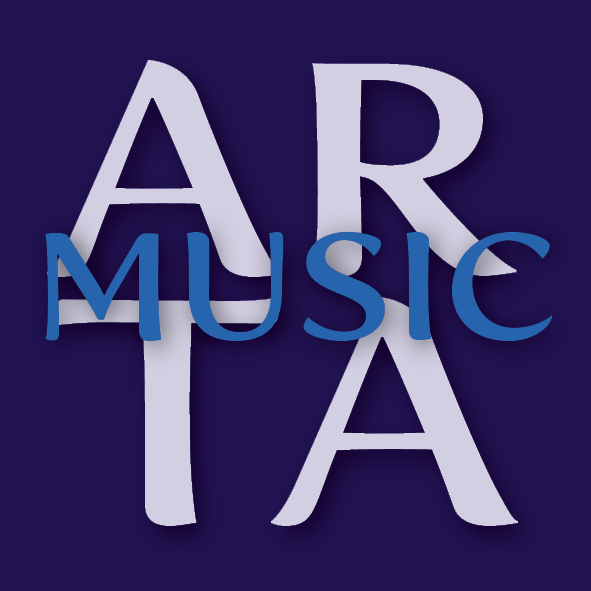 Several of the Jarrett tunes heard here, amongst them “Everything That Lives Laments” and “Piece for Ornette”, would also find expression in the quartet repertoire. Much inspired quartet music was ahead, including the landmark albums The Survivors’ Suite and Eyes of the Heart. 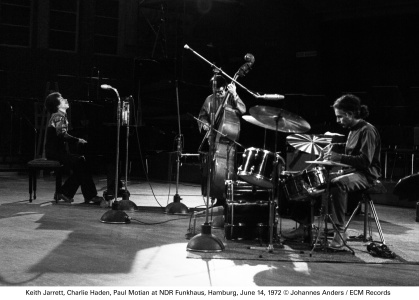 But Hamburg ’72 captures the core trio of Keith Jarrett, Charlie Haden and Paul Motian at the very apex of its creativity. The trio’s earlier albums were Life Between The Exit Signs (recorded 1967), Somewhere Before (1968) and The Mourning of a Star (1971).